Leros passenger and car ferry ticket prices, timetables, ticket reservations and information for ferries sailing from Leros to Kalymnos, Kastelorizo, Kos, Patmos, Piraeus, Rhodes and Syros. Compare all available Leros ferry ticket prices in real time and book the cheapest available Leros car and passenger ferry tickets sailing to and from Leros, Kalymnos, Kastelorizo, Kos, Patmos, Piraeus, Rhodes and Syros with Blue Star Ferry Line ferries online with instant confirmation. Book Leros Ferry Tickets with Blue Star Ferry Line for ferries sailing from Leros to Kalymnos, Kastelorizo, Kos, Patmos, Piraeus, Rhodes and Syros online in advance to enjoy the cheapest available ferry ticket price. The price you see is the price you pay. There are no hidden extras or surprises such as added fuel surcharges or booking fees and we do not charge you anything extra for paying with a Visa Electron card. The price we quote you for your selected Leros passenger or car ferry ticket, onboard accommodation and vehicle type is all you will pay, and that's a promise. To obtain a Leros ferry ticket price and book your ferry ticket securely online please use the real time ferry booking form on the left. You are also able to add a hotel at your destination, or anywhere else, to your ferry ticket when completing your ferry ticket reservation. Leros situated between Patmos Lipsi and Kalimnos in the Dodecanese islands. Leros like most of the Greek islands is an island of small fertile valleys sandwiched between rolling green hills, deep coves and pretty beaches Leros topography has given rise to many villages. It starts at the seaside and gradually climbs up the sides of the hill, whose summit is dominated by the remains of a Byzantine castle. Still standing today are the circuit wall and the church of Our Lady within it . Leros is one of the largest and best natural harbours in the Mediterranean sea. A mountainous, green island with high cliffs and many small bays and villages, Leros is a popular holiday resort which still has kept most of its genuine atmosphere. One of the reasons is that it is not too dependent on tourism. Many of the buildings on the island are built in Italian style, but you'll also find those typically Greek little white houses with blue doors and windows. According to mythology, Leros was first populated by the goddess Artemis. She had sent the Calydonian Boar to Aetolia, where the king's son Meleagros managed to kill it. Having angered the goddess, he was killed, and his sisters were struck with grief. Artemis then turned them into hens and put them on Leros which was so fertile they would always have food. According to another myth. The first king of Leros was Thessalos, son of Heracles. Archaeologists believe that the first inhabitants of the island were peoples from Asia Minor and Phoenicia. It took part in the Trojan War, and also fought the Persians by the Athenian side in the 5th century BC. It was then ruled by Macedonians and Romans. As in the case of most Greek islands, Leros was tormented by constant pirate attacks during the Middle Ages, and for 300 years it belonged to the monastery of Patmos. The Knights of St. John from Rhodes took the island in 1319, and Leros was then invaded by the Turks in 1522. In the 16th century it belonged to the Venetians for a short time. The men of Leros fought hard during the war of Independence that broke out in 1821. For a few years it was free, but the Protocol of London then turned it back to the Turks in 1830. The Italians ruled the island from 1912 and Leros was not given back to Greece until 1948. It was during this Italian occupation when many of today's buildings were constructed on the island, giving it the Italian style many are surprised to find here. Leros was the battle field of a huge offensive in 1943 when the German forces tried to recapture the island from the Italian, British and Greek forces. The island was heavily bombarded for more than one and a half month from the 26 of September until the 16 of November when finaly was occupied by the German forces . The film 'the Guns of Navarone' was probably inspired by the battle of Leros, this is why the fiction island was called Keros. The island was unified with Greece in 1948 like the rest of the Dodecanese islands. One of the most striking features of Leros is the Kastro of the Virgin Mary (Panagia Kastrou) that towers above the island's capital Platanos. It dates back to the 11th century, and was a stronghold for the Knights of St. John. Here, there is also a museum with findings from various time periods, as well as an old church. In Platanos stands the old cathedral Agia Paraskevi. The town itself is nice for strolling around in, and most of the houses were built in the 1800's. In Alinda you can visit the church of Agios Isidoros that was built on top of an ancient temple. There is also a castle here the Belenis tower which is open to the public, and holds some interesting finds from the island, including parts of the warship Queen Olga that was sunk here by the Germans in 1943. The island's first printer can also be seen here. Just outside Partheni before the airport of Leros there are the remains of a temple of Artemis. In Xerokambos you can visit the church of Panagia Kavouradina ("The Virgin Mary of Crabs"). Legend has it that a fisher man found it here, and was immediately cured from a crab bite on his hand. In a dream he was told by a woman dressed in black to return the icon to where it was found, and so the church was built. Near Xirokampos are the ruins of a Prehistoric citadel at Paleokastro. Don't miss a visit to the war museum of Leros build in a war tunnel at the area of Merkia a few hundred meters west of the port of Lakki. In the museum there are weapons, uniforms and other items from the second world war. There are water sports at several beaches like wind surfing and jet ski. Snorkelling and underwater fishing is very popular here and there are also tennis and basket ball courts. There is also a festival on Alinda beach in August during the naval week, on August 14 the Panagia Kastrou is celebrated. In Septemper is the fishermen fest in Panteli with live traditional music and free fish and wine. Another festival is held in Gurna in July the festival of Alonaris. You can also go on daytrips to Lipsi and other small islands around Leros, there is a boat the Barbarosa that lives daily at 11 am from Agia Marina and returns at 19.00 daily during the summer, every trip includes swimming in the white sand beaches of small islets like Aspronisia, Marathi or Tiganakia and free ouzo with meze. In Lakki there is a cinema (Cine Konstantinos) and all films are shown in their original languages with Greek subtitles. There are many beaches on Leros. Most popular and touristy is the beach of Alinda. Further from Alinda are the beaches of Panagies and Dyo Lisgaria with nice restaurants and cafes. The beach of Gurna to the west is one of the few sandy beaches on Leros, in the same area are the beaches of Kokali and Drymonas. In Lakki are the beaches of Koulouki with sand and Merkies with pebbles. Vromoltho beach to the east has sand on the two ends, there you will find restaurants and a cafe bar.The beach of Xirokampos is another beach with tamarisk trees partly sandy and pebble. In the north part of the island is located the beach of Blefuti a few hundred meters after Partheni. It is a nice beach with tamarisk trees and a nice taverna. Another popular beach is the beach of Panteli. There you can swim and enjoy the scenery of the most traditional fishermen's village on Leros. Small taverns, restaurants and cafes where the local fishermen enjoy their ouzo, fishing boats and nets in a place where the tourism has not change its traditional way of life. Don't expect to find on Leros the party island nightlife like in Kos, Mykonos or Santorini. There are music bars and live music places. Most of the nightlife is in Agia Marina, here you will find many bars like the Meltemi, Apothiki, Harama where you can dance with Greek and international music until the early morning hours. In Alinda there are also some nice bars like the Alaloum and Cosmopolitan. Panteli is one of the most popular places for the night outing as it has many fish taverns and restaurants as well as a wonderful cafeteria the Castelo on the west side of the beach where you can enjoy the panorama of the village with nice cocktails, ice creams and snacks, the cafeteria organises music events with local dances and music throughout the summer season so you can check at the local advertisement and posters. Right on the other side of the beach is a picturesque music bar where you can enjoy international music and fantastic cocktails made by the two British owners. Best Price Guarantee - We always offer you our lowest available Blue Star Ferry Line passenger and car ferries ticket price to and from Leros. There are no hidden extras or surprises such as added fuel surcharges or booking fees and we also we do not charge you anything extra for paying with a Visa Electron card. The price we quote for your selected Leros ferry ticket, onboard accommodation and vehicle type is all you will pay, and that's a promise! In the unlikely event you find the same all inclusive Leros ferry ticket cheaper in the brochure of any other tour operator we promise that we will do our best to beat that price or offer you the choice of requesting a refund. 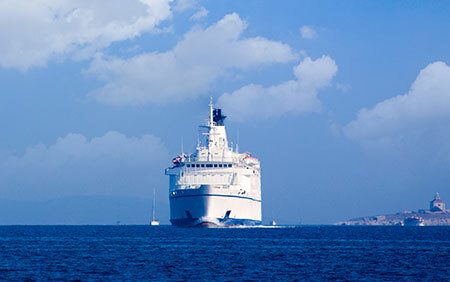 To book Leros car and passenger ferry tickets please click here. At ferryto.com you are able to obtain live Leros ferry ticket prices, check availability and book car and passenger ferry tickets to and from Leros at our lowest available ticket price. Ferryto.com is part of the world's largest online ferry ticket distribution network providing the ability to book over 80 major European ferry operators including to Leros and to over 1,200 other ferry routes throughout the UK, France, Spain, Ireland, Holland, Eastern Europe, the Mediterranean, the Baltic and North Africa.